An 1850s rendering of "Citizen Know Nothing"
Recently, the PBS series, American Experience, devoted an episode to Buffalo Bill Cody, who may well have been the first international celebrity. Cody was a great showman and entrepreneur, and the Wild West spectacular he put together charmed millions both in the U.S. and Europe. By the time he died in 1917, he singlehandedly defined the popular view of the American West and even the conventional narrative of U.S. history. You should buy the DVD online. It’s well worth your time. Part of the program dealt with the relationship between Cody and Ned Buntline, whose writing is widely credited for making Buffalo Bill. 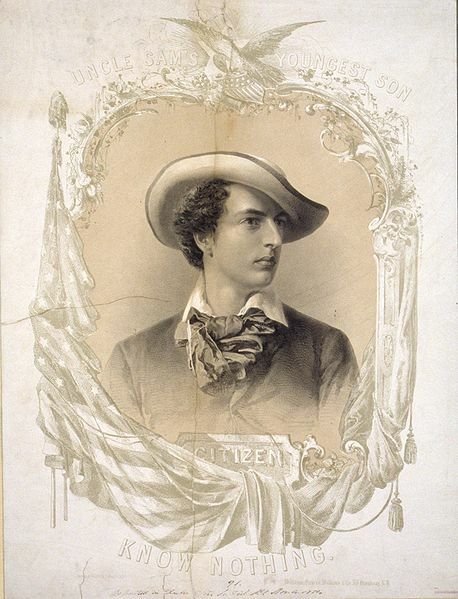 Buntline also was a founder of the Know-Nothing Party, which had its heyday in the 1850s. Although the Know-Nothings had faded by the time Buntline and Cody met, Cody sensed that Buntline wanted to press him into service for similar causes, and he wanted nothing to do with it. The party got its name because members, if asked about party activities, were supposed to respond that they “know nothing.” It was empowered by popular fears that the country was being overwhelmed by German and Irish Catholic immigrants, who were often regarded as hostile to Anglo-Saxon Protestant values and controlled by the pope in Rome. The Know-Nothings believed that immigration should be severely limited and that political office should be restricted only to “native-born” Protestant Americans of English or Scottish lineage. (In the mind of a Know-Nothing, “native born” had nothing to do with those we call “native American” today.) Some maintain that the spirit of the Know-Nothings lives on today in groups like the Ku Klux Klan. Cody had grown up in Kansas before the Civil War. Pro-slavery neighbors and militias had terrorized the family. When Cody’s father spoke out against slavery at a town meeting, he was stabbed by a neighbor as the 8-year-old boy looked on. Cody would become the family’s main breadwinner three years later, when his father finally died of his wounds. Cody, being his father’s son, wanted no part of movements that would make other people the brunt of prejudice and limit their opportunities. Today, of course, we fight our own battles over immigration. The Know-Nothings feared that they could be supplanted by the Germans and the Irish. Some of us today fear that illegal immigrants are taking slices of a pie that appears to be shrinking. That fear persists even as the evidence shows that illegal immigration is shrinking, not growing, as a phenomenon in the U.S. Severe limits on immigration, especially from Catholic countries. Restricting political office to native-born Americans of English and/or Scottish lineage and Protestant persuasion. Restricting public school teacher positions to Protestants. Mandating daily Bible readings in public schools. Restricting the sale of liquor. Restricting the use of languages other than English. The desire is understandable, I suppose. If you have a good thing, you fight to keep it. But there are higher principles to fight for, too, such as justice and equality. So far, the story of America has been that, over time, justice and equality win out. People of goodwill have to keep seeking liberty and justice for all. The evidence is slight at times, but I’m confident that today, as yesterday, people of goodwill will win out. This entry was posted in Politics, Religion, Society and tagged bigotry, Buffalo Bill Cody, fear, immigration, Know Nothing Party, racism. Bookmark the permalink.